Note on High School Edition: Adapted in collaboration with iTheatrics, Kander & Ebb's legendary and award-winning musical about fame, fortune and acquittal is now widely available to be performed by High Schools across the world. Note that high school and youth organizations may not produce the standard version of CHICAGO, and must apply for CHICAGO: HIGH SCHOOL EDITION. Setting: Chicago, Illinois. The late 1920s. Vaudville performer who is accused of murdering her sister and husband. Hardened by fame, she cares for no one but herself and her attempt to get away with murder. Reads and keeps up with murder trials in Chicago, and follows suit by murdering her lover, Fred Casely. She stops at nothing to render a media storm with one goal: to get away with it. Roxie’s short lived lover. Murdered for trying to leave Roxie. Assigned to Roxie’s case. After asking the right questions, he manages to get Roxie to confess. Roxie’s faithful husband. Lies for her and tries to take the blame until he realizes that he has been two-timed by Roxie. Still in love with her, or misguided, he believes anything she says in her pursuit to get out of jail. Prisoner at Cook County Jail. She is imprisoned after shooting two warning shots into her husband’s head. Prisoner at Cook County Jail. After her husband accuses her of screwing the milk man, he mysteriously runs into her knife ten times. Hungarian Prisoner at Cook County Jail. The only English she speaks is the phase, “Not Guilty.” Which follows her to her grave. Ensemble member who doubles as the Master of Ceremonies at times. Established lawyer who hasn’t lost a woman’s case yet. Master of media manipulation who will get a girl off the hook as long as she can fork up the hefty $5,000 fee. Sob sister reporter from the Evening Star. Believes there is a little bit of good in everyone and will believe anything she is fed that matches her beliefs. Murdered by Go-To-Hell Kitty for sleeping around with three women behind her back. Court appointed lawyer for Hunyak. He tries to get her to confess to speed along the trial. 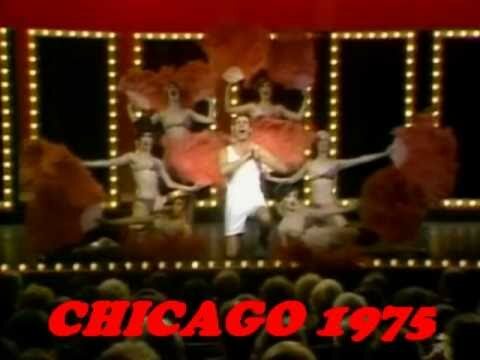 Chicago first opened on Broadway at the 46th Street Theatre in New York City on June 3, 1975. It was directed and choreographed by Bob Fosse.